Product #5823 | SKU FAF04201 | 0.0 (no ratings yet) Thanks for your rating! 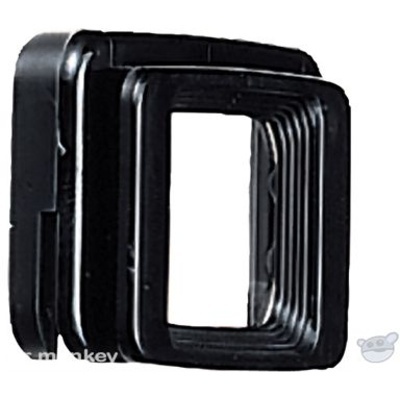 For Nikon D200, D80, D40, and D40X. The DK-20C +0.5 Correction Eyepiece for Rectangular-Style Viewfinder from Nikon allows you to optimise your SLR/DSLR viewfinder's sharpness in conjunction with your individual eyesight. Nikon SLR/DSLR cameras (without built-in adjustable eyepiece correction) have a base dioptre value of minus one. Minus one is considered the optimum starting point for the majority of SLR/DSLR users with normal vision. The combination of the camera's viewfinder components and a clear (standard) eyepiece form a virtual image of a subject on the camera's focusing screen that is the approximate equivalent of a viewing distance of one metre. Each Nikon eyepiece dioptre incorporates a numerical value, represented by a minus value (nearsighted) or a plus value (farsighted) number, enabling you to select the appropriate dioptre for your vision and your camera model. The eyepiece's dioptre value is, when combined with the viewfinders minus one value, the end-result value. No combination of the camera's base value of minus one and a given accessory dioptre's value is required to arrive at the final desired value. In other words, if you require a dioptre of plus 3, simply add a plus 3 dioptre to your camera. Box Dimensions (LxWxH) 4.2 x 2.9 x 0.02"